Bundesliga | Thomas Müller: "Kingsley Coman can be solid gold for Bayern Munich!" Thomas Müller: "Kingsley Coman can be solid gold for Bayern Munich!" 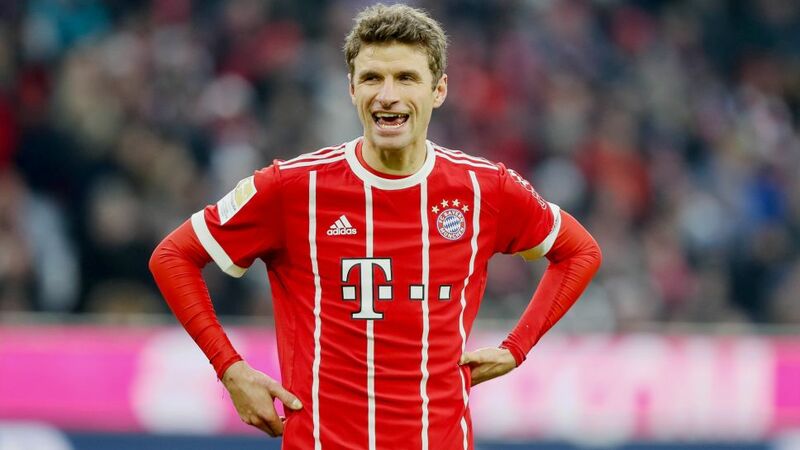 Thomas Müller returned to Bayern Munich's starting XI on Saturday, helping the record champions open up a six point lead at the top of the Bundesliga with a 3-1 win over Hannover. The Germany star had a pair of assists in the game, but he still reserved special praise for the man playing on the opposite flank to him, Kingsley Coman. Question: Thomas Müller, how satisfied are you with the 3-1 win against Hannover? Thomas Müller: It was a good game, nice to watch. Of course you could also find room for improvement. We managed three goals but we didn't manage to turn defence into attack too well. All in all we had the game under control, though. Question: How do you think your comeback went personally? Müller: It went well, we won and I slotted into the game well. I still have to work on my match fitness, but I'm not dissatisfied. Question: You were injured for about six weeks. Does such a time on the sidelines bring into focus how much football means to you? Müller: That's very philosophical (laughs)! If you watch games on TV, especially those that are big experiences - like the DFB penalty shoot-out win over RB Leipzig, a special game in Glasgow [Bayern beat Celtic 2-1 in the UEFA Champions League last month], or an important game in Dortmund [Bayern beat Borussia 3-1 in the Klassiker on Matchday 11], if you watch these on the couch it's not easy. On the other hand, I'm not a guy who worries about things that can't be helped. You just have to make the most of things. Question: Bayern are now six points clear of Leipzig at the top of the table, and 10 points clear of last season's third-place team, Dortmund. Who do you see as your biggest challenge in the race for the title? Müller: The team who is closest to us! Six points is not a world away and before this weekend our advantage was only three points. A lot can still happen. We want to see what happens over Christmas. At best, we can come out the other side even further ahead in the table. Question: Kingsley Coman stood out in this game. Is he the future of Bayern on the wings? Müller: We have many players who have very good qualities. We know that Kingsley has extraordinary skills that aren't easy to find. If he puts his foot down on the gas – and he has incredible horsepower – every opponent has a tough time against him. He worked the left flank well. He's always been fleet-footed. If he can now add chances that lead to goals then he is solid gold to us. Question: Does the Champions League match against Paris Saint-Germain on Tuesday come at just the right time? Müller: We know that we still have a really difficult run of games. I don't see any games ahead that we can take lightly. We need the whole squad and good performances from everyone. Question: What is at stake on Tuesday? Forgetting the 3-0 defeat from the reverse fixture, do you still have a chance to win the group? Müller: It depends how the game is going. Basically, we want to play to win. But we're certainly not going to play with six strikers just because we know we'd need a 4-0 win to top the group. It's about winning the game. Depending on how it goes we might get a second wind.